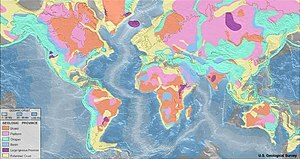 A geological or geologic map is a special-purpose map made to show geological features. 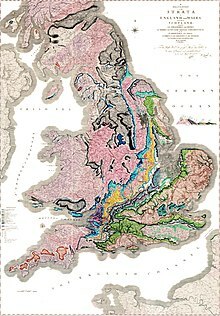 William Smith made the first geological map of England. Rock units or strata are shown by colour or symbols which show where they are exposed at the surface. Three-dimensional features like faults, folds, with symbols which give these features' orientations. Stratigraphic contour lines may be used to illustrate the surface of a selected strata illustrating the subsurface topographic trends of the strata. Isopach maps detail the variations in thickness of stratigraphic units. It is not always possible to show this properly: the strata may be extremely fractured, mixed, or otherwise disturbed. There are often gaps (discontinuities) where erosion has removed strata. This page was last changed on 27 February 2018, at 16:43.